← Incredibly Easy Holiday Tradition Learn How to Make Reindeer Food! Looking for Valentine Craft Ideas? Valentine’s Day Love Bug Craft For Kids will make an excellent kid-made gift idea! These are easy and fun to make with the kids. They’re quick, inexpensive and easy. Love is in the air. Love bugs that is. With Valentine’s Day fast approaching, your kids will be itching for some hands-on activities. 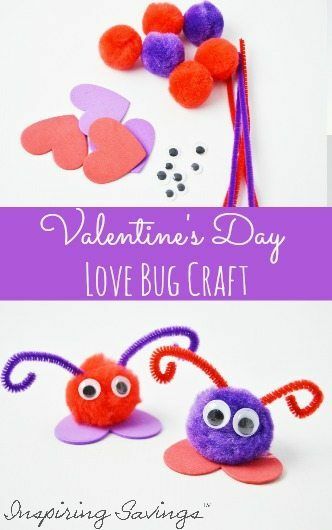 This Valentine’s Day Love Bug Craft will make a great activity for school parties, play dates, or any day leading up to Valentine’s Day! These love bugs are super simple to make. Which is always a BIG plus for this MAMA. It seems that my kids are always in a hurry to get set up to make any craft. I know I am not the only one with kids who love craft time. Remember those cute little pompom art projects you used to make as a kid for Valentine’s day? You know the ones… pompom bodies, googly eyes, and little antenna ears. Well, that childhood favorite is now going to be passed down to your children. Valentine’s Day is a great time to teach your kids about the many forms of love. The word LOVE, after all, will be heard throughout the month of February. We LOVE pizza, we LOVE our children, we LOVE God and we LOVE the new dress our friend is wearing. The word Love gets used a lot. There are many types of love you can read this article about each form. Keep in mind that you may already have some of these items in your current craft supplies. First, cut your pipe cleaners to about 3”-4” long. You will need two for each bug, so keep that in mind when cutting. Curl the ends of the pipe cleaners (these will be your antennae), and set them aside. You will need one heart, one pom-pom, two pipe cleaner pieces, and two (or more, they’re bugs!) googly eyes for each love bug! Put a spot of hot glue on the ends of the antennae and press it into the pom-pom. 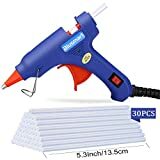 With the use of hot glue, you may need to have those little hands off. Next, glue on the googly eyes. Then, finally, to finish them off, glue them to the heart, with the pointy part of the heart facing backward. Mix and match colors to make it fun! You can always use glue dots, instead of hot glue, if you want the kids to be able to help you safely! Pair them with a cute note, or piece of candy to make an adorable Valentine gift! My daughter loves making these to give to people. She insists on having people keep them in their pockets, so if they ever felt sad or lonely, they could reach into their pocket and squeeze the love bug to feel loved! I just love this project and how cute the little faces turned out. You can have your kids go one step further and make them silly love bugs simply by positioning the googly eyes in different spots. World’s Best & Easiest Chocolate Fudge!